iCal, Apple’s built-in calendar application, sees some big changes in Mac OS X Lion. Many of the visual tweaks are borrowed from the Calendar iOS app on the iPad, with a focus on making appointments easier to view, and in some cases giving you more room in which to view them. There’s also a new way to enter events, a new view, and more. In Lion, iCal gets a makeover. The first thing you’ll notice is that the boring gray title bar of old has been replaced by a leather-looking pattern reminiscent of an old desktop calendar. In Apple’s typical attention to detail, there’s realistic stitching in the leather, and if you look closely, you’ll even see the remaining bits of pages ‘torn off’ the calendar. Event bubbles have seen some changes, too. Shading is darker, and text is rendered in a heavier, bolded font. Both changes make events stand out better and make them easier to read at the same time. Calendars now appear only as a pop-up menu when you click the Calendars button. The list of calendars, which in the past was a sidebar that you could either show or hide, is now hidden by default; it only appears as a pop-up menu when you click the new Calendars button (much like on the iPad). Although this helps save space, I wish Apple had left the option to keep the calendar list open as a sidebar for those who want it, rather than forcing iOS behavior on OS X users. As you can in iTunes and Mail, you can hide groups of calendars from the list by clicking the Hide text that appears when you put your cursor over a heading. This doesn’t hide the events from those calendars, just the list of calendars under that heading—to hide the events, you uncheck the box in front of each calendar’s name, just as before. Because the Calendar list is generally out of the way, you won’t see the spinning gears next to each calendar to indicate that it’s refreshing. Instead, the word “Updating” appears in gray next to the word “iCal” in the title bar during those times. Speaking of calendars, if you’ve used iCal to sync with Google Calendar in the past, you’ve probably noticed that the process isn’t always smooth. If you have multiple Google calendars linked to a specific account (as we do at Macworld) you must fiddle with settings on the Google end, and then visit iCal’s Accounts preference tab to individually check each calendar you want under Delegation. Even then, iCal often has trouble connecting to certain Google calendars, even those on the same account. This headache hasn’t changed in iCal 5. To the right of the Calendars button is an Add (+) button. Click it, and up pops a Create Quick Event window that lets you add events to your calendars using regular-language phrases. For example, enter Dinner at The White House at 7PM on Saturday and iCal creates an event in your default calendar (although you can pick a different calendar before you click Done) with the name “Dinner at The White House” from 7PM to 8PM on the upcoming Saturday. Or change at 7PM to from 7PM to 9PM and Saturday to July 23 to create an event that lasts two hours and is on that specific date. For relatively simple events, the process works quite well. To create a repeating event or add an alert, say, you’ll have to create the event and then open the event’s editor. Previously, picking a calendar and selecting File -> New Event or double-clicking in iCal to create an event would do so on that selected calendar. Now, double-clicking creates the event on your default calendar, and you have to edit or Get Info on the event to select a different one. And the New Event command just brings up the Create Quick Event pop-up mentioned earlier. But if you click and hold the Create Quick Event plus (+) sign button, you can select the calendar to which you want to add the new event. A revamped Today button, which has moved from the upper left to the upper right of the iCal window, is now flanked by arrow buttons. Depending on the view you’re in, those arrows move back or forward by one day, one week, one month, or one year. Another small change: Apple has dropped the colon and double zeros of events that begin on the hour—6:00PM had become simply 6PM. Lion’s iCal looks more like the Calendar app on the iPad than ever before. In fact, the Day views are almost identical, with a list of that day’s events on the left side, and all-day events and timed events in a chronological format, on the right. Now you get a scrollable list of events, which was a big feature missing from iCal for a long time. One key difference: to move between days in iCal, you can swipe with two fingers (by default) using a Multi-Touch trackpad, or click a day on the month’s calendar on the left side, while the iPad’s Calendar app requires you to tap on either the calendar, a day on the strip at the bottom of the screen, or a left or right arrow at either end of the strip. The new Day view is much nicer than the one you’ll find in Snow Leopard’s iCal, which basically is just an expansion of a single day from the Week view. The Week view in the new version of iCal is very similar to that in iCal 4 (part of Snow Leopard). You still see all-day events in a section at the top of each day, and other events displayed in their respective time slots. But rather than full days listed atop each day of the week (Wednesday, July 20), you’ll see the date followed by the day of the week (20 Wednesday). And where iCal used to have the year (2011) listed in the same font size to the left of the days, Lion now shows a large month, week, and year (July 17 - 23, 2011) at the top of that week’s calendar. The All-Day area at the top of the Week view is now a fixed size, and you can scroll up and down to see all the events. On the minus side, however, when you scroll down, you can no longer see the day and date of the week—a curious oversight on Apple’s part. Previously, that area would expand enough to fit every all-day event for the longest day in that week, which meant a lot of white space for some of the other days. Using a multi-touch gesture trackpad, you can scroll between weeks with a two-finger swipe, and the page simply slides over to reveal the previous or next week. The Month view hasn’t changed that much in iCal 5, but it does fix some annoyances with the previous version. In the past, the number of events you’d see each day was limited by the size of your iCal window and your display—on my MacBook Pro, for example, I see fewer items in Month view in iCal 4 than I do on my iMac. With Lion’s iCal 5, you’re still limited by screen real estate, but at least the application lets you know how many other items there are that you’re not seeing—“13 more…”, for example. Double-click on that and you’re taken to the Day view for that day. That said, it would be better if you could scroll down within a day in Month view to see all of that day’s events without having to open a new view. Another improvement is that instead of just rather subtle background shading to indicate the current day in the month, the new iCal adds the word “Today” in bolded blue text and adds the name of the month to the day-only listing for every other day (July 20 versus just 20), also in blue. A two-finger swipe in either direction switches the month with a page-lifting effect like on the iPad. iCal's new color-coded Year view, as seen in full-screen mode. Lastly, Apple has added a new Year view to iCal in Lion. As you might expect, it shows mini calendars for each of the 12 months in a particular year. The top of the current month, as well as the current day, are highlighted with a strong blue background that helps you easily see where in the year you are now. But there’s also another use of color in the year view: color-coding, much like a heat map, to indicate how busy each day is. Days with little or no activity have white backgrounds, and go from yellow to orange to red (with different degrees of shading) to indicate more and more planned events. Each month shows six full weeks in order to display enough days for every month and to maintain a consistent size; days that aren’t part of a particular month (the last few days of July in the August calendar, for example) display with a gray background (but show up correctly color-coded in the month in which they belong). Two-finger swiping (or, as with other views, clicking the arrows next to the Today button) switches between years with the same page-turning effect as Month view. Like many of the built-in apps in Lion, iCal can now runs as a full-screen app. Click the two arrows pointing away from each other in the upper right corner of iCal (just above the search box), and iCal expands to fill your entire screen. Move your cursor up to the title bar, and the OS X menu bar drops down, complete with a similar icon to the page-expanding one (this time two white arrows point toward each other in a blue box) that you can click to revert back to normal window size and operation. Full-screen mode is a nice option, but it feels less important than it might be for other applications. Click the File menu, and you’ll see that the New To Do item in iCal 4 has changed to New Reminder in iCal 5. That’s because Apple has renamed To Do as Reminder, but the change is in name only—Reminders appear to function just like To Do items did in the past. Birthdays now appear with the age that person (or in the case of twins, those people) will be each year. Another subtle change affects contacts to which you’ve added a birthday in Address Book; that item will now show the age that person will be in each instance in your calendar. To get birthdays to show up in iCal, you’ll need to go to Preferences -> General and select the Show Birthday Calendar option. If you don’t enter the year of birth for a contact—information you’re now allowed to omit in the birthday field with the Lion version of Address Book—you’ll see the birthday without an age as before. Plus, instead of showing up like any other event, birthdays are now indicated by a red gift box (complete with bow) before the name. 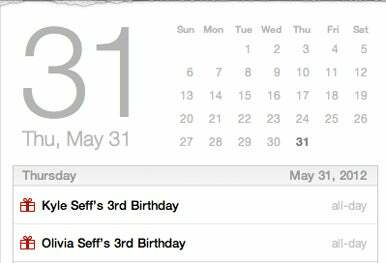 This makes it much easier to notice upcoming birthdays than in iCal 4. Also, if you use the keyboard to navigate among events using arrow keys, when you move to an event it quickly pulses, expanding out and then back to normal size to indicate where you are. iCal’s preferences features three tabs. General hasn’t changed much from Snow Leopard to Lion. 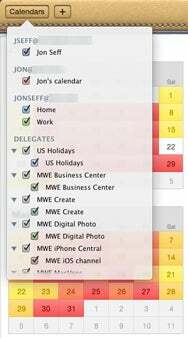 iCal 4 had a Synchronize iCal With Other Computers and Devices Using MobileMe option, which has been removed from the Lion version of iCal. That behavior is now handled via the Mail, Contacts & Calendars System Preference pane (perhaps not a big surprise considering Apple is phasing out MobileMe for iCloud). Lion adds one option not in the previous version: a Default Calendar pop-up menu that lets you choose which calendar (if you have multiple ones) to add new events to by default. In iCal 4, whichever calendar was first in your list became the default. (Note that you can still reorder your calendars in the Calendars list, but changes won’t impact which calendar is the default.) And the wording changed slightly on another option: Show Event Times In Month View has become simply Show Event Times. The Accounts tab, where you add and manage accounts, has changed somewhat, due to the way Lion now handles mail, contacts, and calendars via the new System Preference pane. In the past, the Account Information tab of iCal’s Accounts pane was where you’d see a description, user name, password, and calendar refresh options for each account. Much of that info is still there in iCal 5, but there’s also an Enable This Account checkbox like you’d find in Mail. A new Edit Account button takes you to the Mail, Contacts & Calendars System Preference panel where you can turn on or off various selections for each account (Mail, iChat, iCal). And the Server Settings tab is no longer. The Advanced tab in Lion is almost identical to that of its predecessor: the one change is that the Automatically Retrieve Invitations From Mail option is now Automatically Retrieve CalDAV Invitations From Mail. iCal 5 is only available as part of OS X Lion (and therefore only runs on the Mac models that support Lion), so it’s a package deal. If you upgrade to Lion, you’re upgrading to iCal 5 as well. I suspect for most people, iCal will work just fine as a calendaring application. However, be aware that as with previous versions, iCal 5’s handling of multiple Google calendars linked to a specific account is inelegant at best. If most or all of your calendars are synced via Google—or you want more control over your calendars and options than iCal offers—you might want to consider a third-party option such as BusyCal, which recently added Lion support as well.